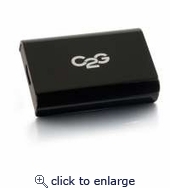 The USB to HDMI Adapter - External Video Card is the perfect solution for adding duplicate or extended desktop to a computer utilizing a USB port. The duplicate feature allows a user to show the same images from the primary display on a secondary display. This is useful in situations where a presentation must be given. The extended desktop feature allows the user to expand the desktop workspace from the primary display to both the primary and secondary display allowing different images to be shown on the two monitors. This is useful for increasing productivity when working in multiple applications or comparing data between two programs. 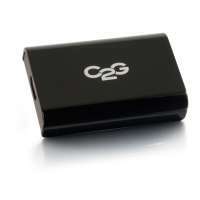 The adapter is designed for compatibility with USB 3.0 ports. The USB 3.0 specification provides up to ten times the bandwidth of USB 2.0, which allows this adapter to support full motion video. Additionally, this adapter has a low power requirement which, when used with a mobile laptop, will allow the laptop battery to last longer. The software required for operation of the adapter is included and is easy to install and configure. Once the software is installed, up to six adapters may be connected to the computer allowing multi-display capability. High definition resolutions of up to 2560x1600 are supported and video streaming is supported at a resolution of up to 1080p. With a compact form factor and rugged housing, this adapter combines functionality and durability, ensuring optimal performance and results.